I love exploring new places by bike, and lately I’ve been doing the same in my hometown. 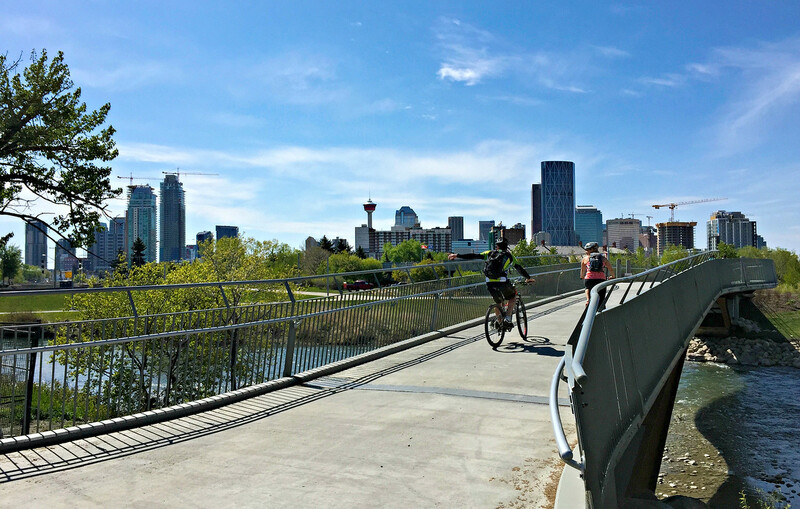 Calgary has an extensive network of bike paths that can take you from the downtown core to almost anywhere you want to go. 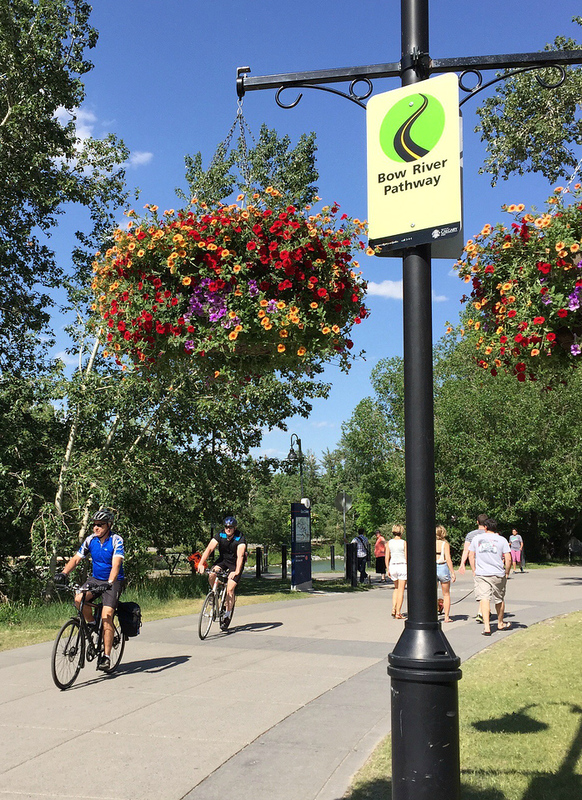 Exploring Calgary by bike on the Bow River Pathway is one of the best ways to experience the city. The Bow River Pathway, near Eau Claire, downtown Calgary. I can cover a lot more ground by bike than walking. It’s easier to stop and explore interesting places than it is by car. I seem to discover more new places by bike than by walking or by car. It’s a good workout. At least it offsets the bakery I’m bound to discover along the way. This route is a favourite of mine, and follows the Bow River Pathway from Edworthy Park at the west end, through downtown Calgary, to Pearce Estate Park at the east end. It passes by some of the inner city’s most interesting neighborhoods, including Kensington, downtown’s Eau Claire and East Village, and historic Inglewood. There are plenty of places near the path to stop for a bite, or have a cold drink on a patio. Several parks along the way provide a green break from the city, and also make a nice spot for a picnic. The ride is about 12 km one way, and takes about 40 minutes at a moderate pace. But you could spend all day depending on stops you make along the way. The Bow River pathway runs along both sides of the river, so it’s easy to do a loop of about 24 km, and you can start your loop at any point. There are also several bridges along the way so you can make your ride shorter or longer. There is free parking at Edworthy Park if you’re driving. For more details, here’s a link to the route on Google Maps. 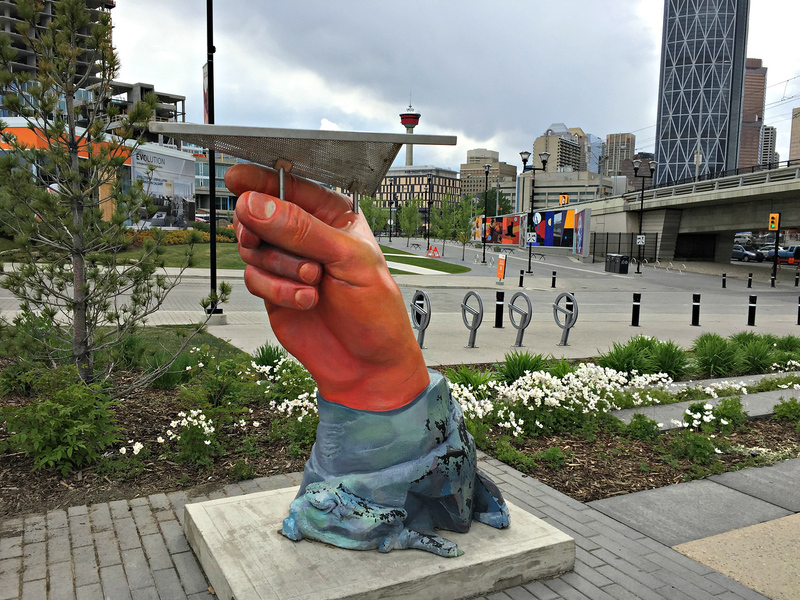 There is a lot of art on display along the Bow River Pathway, including this sculpture in the revitalized East River district. 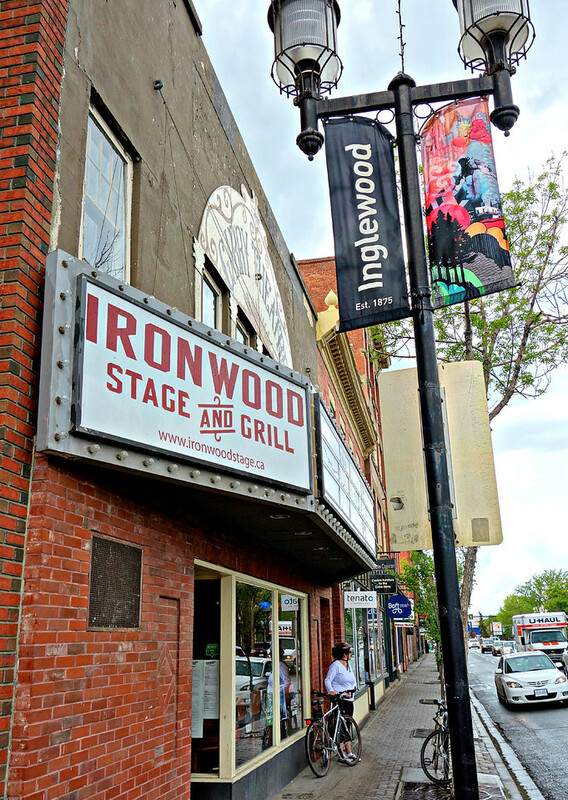 Inglewood is Calgary’s oldest neighbourhoods; and one of Calgary’s most interesting areas to explore, with unique shops, antiques, and restaurants. Ninth Ave, originally Main Street is just a couple blocks from the bike path. I’m hiding out here from a rain shower that left as quick as it came. Near Inglewood looking towards downtown Calgary. 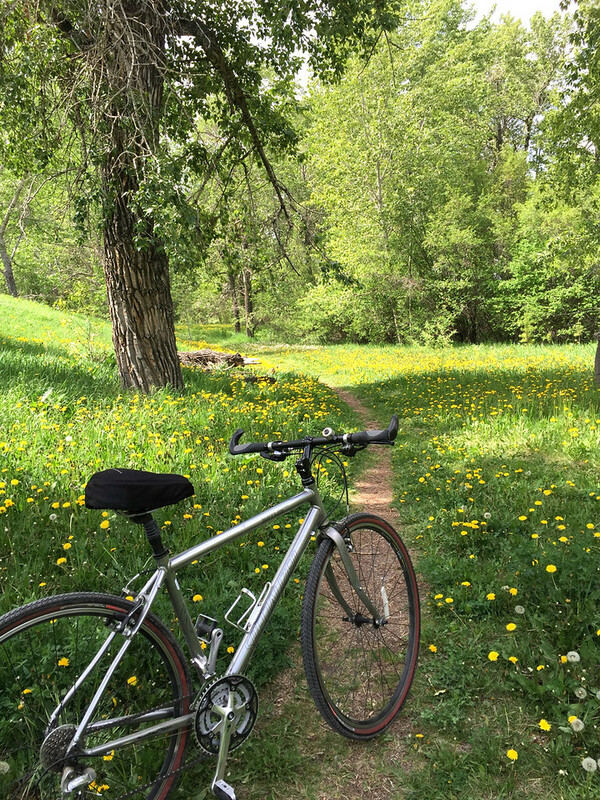 Pearce Estate Park – An unexpected scene a fifteen minute ride from downtown Calgary. Any food you eat while out on a bike ride doesn’t count, right? Kensington: Many pubs and restaurants to choose from, including Higher Ground for coffee, Vero Bistro Moderne (on 10 St), and Julio’s Barrio. Prince’s Island Park: The River Cafe is splurge-worthy, both for its food and setting in the park. Their early bird dinner is a good value. Downtown: Several places in the Eau Claire area, and many more throughout downtown, including on 8th Ave (the Stephen Avenue Mall). East Village: Right next to the bike path, check out the Simmons Building, with options for dining in or takeout: Charbar, Sidewalk Citizen Bakery, and Phil & Sebastian Coffee Roasters. Inglewood: Again, many options, including Spolumbo’s (for deli sandwiches), Minh Chau Vietnamese, and Choklat for an excellent chocolate fix. Here are four bike rental places near the route. For further information on the City of Calgary’s Bike Paths click here. I live in Edmonton, so I usually come down to Calgary a couple of times a year. I never really thought to rent a bike to explore the city, but it looks like a nice option. The paths go everywhere but I especially like the river paths as there are no big hills to climb. Likewise I haven’t explored Edmonton by bike but maybe I should! i love how Canadians make the most of all opportunities to be active and for it to also be convenient. This looks great! It’s always nice to master your own town. 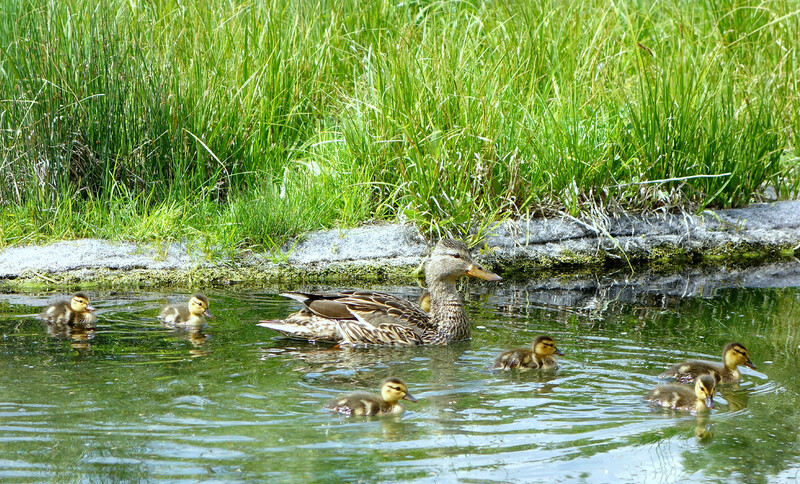 I especially like that bike path in Calgary’s Pearce Estate Park, and the sweet duckies. I’ve lived in Calgary 40 years and didn’t know Pearce Estate Park existed until I recently followed that bike path a little further than usual. It’s nice to find a new place in your own town. We love riding our bikes and this looks like a fine bike path. Haven’t had the chance to explore Calgary yet but this sure makes us want to. Thanks! I think you would have a great time here. Lots of adventures to be had! Great photos- I’m not a bicyclist but I love to eat. 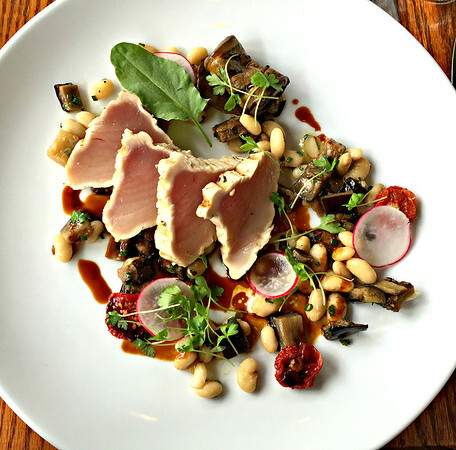 Calgary seems to have great food. Every once in a while I catch one on the Food Network and we had a guest post on brunch places on the Edmonton Trail. Would love to eat my way through the city! Thanks Billie! I think Calgarians are really open to trying new foods. Besides the beef we’re known for, it’s very multicultural here and you can find almost anything. And I agree there are some great brunch places on Edmonton Trail! Love that you included fine fare as a reward for all that cycling! I was in Calgary years ago, and brought my rollerblades to do the trail, and even chose my B&B because it was right opposite the river. Great path! I have to keep up my strength, right? Next to the river would be a great choice for a B&B. I’m totally with you on loving to explore by bike — especially on the flatter trails. I just don’t get enough opportunities to do it. Calgary looks like an awesome place to get cycling. It also looks like I’d have some great food options along the way and it’s always fun for me to come across public art in places I visit. Flatter trails are key for me too! That’s why I like paths that follow along a river. I usually veer away from exploring by bike in a big city but your pictures and suggestions make it seem like such a great way to see Calgary. Such a surprise to see the city too in summer! We’ve had great weather in Calgary this spring. These bike paths feel fairly safe even though they run through the heart of the city, as they don’t compete with traffic and usually tunnel under the intersections.